Our arXiv paper and the associated R package polyreg caused a bit of a stir, both pro and con, when we first announced them here in June. The discussion even spread as far as Twitter, Reddit and Hacker News. We’ll be announcing a revised paper, and various new features to the package, very soon. But the purpose of this blog post is to focus on one particular new feature, a visualization tool. 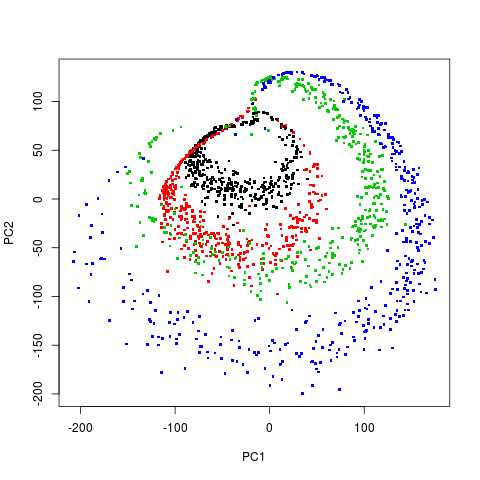 Over the years a number of “nonlinear” methods generalizing Principal Components Analysis (PCA) have been proposed, such as ICA and KPCA some time ago, and more recently t-SNE and UMAP. I’ve long felt that applying PCA to “polynomial-ized” versions of one’s data should do well too, and of course much more simply, a major virtue. So, now that we have machinery, the polyreg package, to conveniently build multivariate polynomial models — including for categorical variables, an important case — I developed a new function in polyreg, named prVis(). I’ll illustrate it in this blog post, and compare it to UMAP. Using one of the MV methods on the 3-column data, and not knowing that the 2-column data was a 4-component mixture, could a person discern that latter fact? 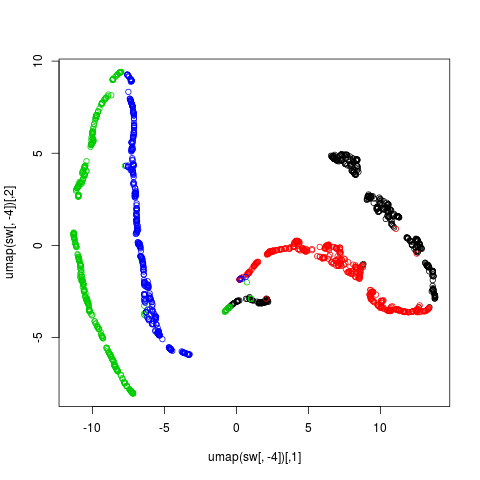 We’ll try UMAP (said to be faster than t-SNE) and prVis(). First, what UMAP implementation to use? Several excellent ones are available for R, such as umapr, umap and uwot. I use the last one, as it was the easiest for me to install, and especially because it includes a predict() method. Here is the code. We read in the data from a file included in the polyreg package into sw, and change the mode of the last column to an R factor. (Code not shown.) The data frame sw actually has 4 columns, the last being the mixture component ID, 1-4. That swirl is where the Swiss Roll model gets its name, and clearly, the picture gives no hint at all as to how many components were in the original data. The model was constructed in such a way that PCA would fail. Wow, that “loop” actually contained 2 of the original components, not just 1. We were led astray. Very nice! Each of the 4 apparent components really did correspond to an actual component. Of course, usually the difference is not this dramatic, but in applying prVis() to a number of examples, I’ve found that it does indeed do as well as, or better than, UMAP and t-SNE, but in a simpler, more easily explained manner, as noted a major virtue. I’ll post another example, showing an interesting interpretation of a real dataset, in the next day or so.